Rivera's one of my favorite spots in LA, so when I heard that John Sedlar was opening up v2.0 in the former Grace space, I was brimming with anticipation. The eatery, now named Playa (a change from the R26 nomenclature tossed around earlier), is meant to be a more informal, less expensive alternative to the original, and is modeled, as the name implies, after the first restaurant's Playa Bar. Sedlar's stint at Test Kitchen was one of the ones that I was most excited about, and apparently, I wasn't alone in my interest. Joining me this evening were Bill of Street Gourmet LA, KCRW's Evan Kleiman and Harriet Ells, Josh of Food GPS, Ken Hwang, Ryan of Epicuryan, ubiquitous photog Ryan Tanaka (a.k.a. rydka), reader Sherwin (whom I met at Plate by Plate), and yes, even Jonathan Gold (Table 42, with wife Laurie Ochoa). 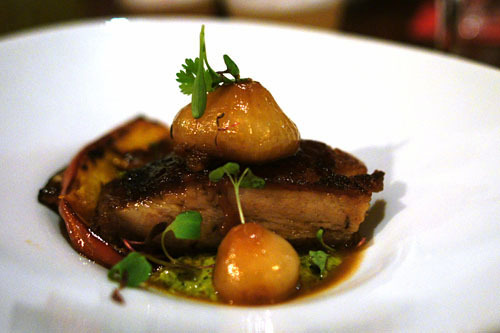 Entitled "The Hallucination," Sedlar's menu offered up five whimsically-named, positively intriguing courses for $60. Cocktails, of course, were the charge of famed Rivera bar man Julian Cox. Click for a larger version. Dinner began with a bang. 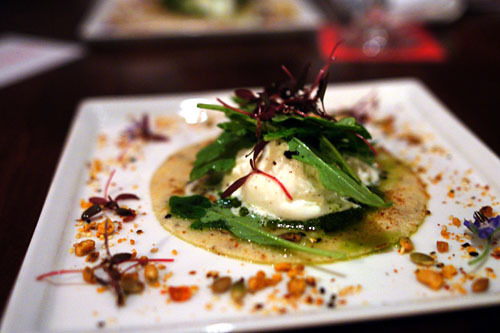 We were presented a singular white flour tortilla, topped with a large dollop of arugula-laced burrata, then garnished with amaranth microgreens, compressed maize, and a semilla ("seed") condiment of dried chile, pumpkin seeds, and peanuts. The pairing of the creamy cheese with the tang of the arugula is a classic, but effective combination. It wasn't terribly interesting on its own, but what was was the enveloping earthiness and nuttiness of the dish--courtesy of that semilla--which served as superb counterpoint to the power of the burrata. I also appreciated the lingering spice of the dish. Lots going on here. We started with a trio of cocktails from bartender extraordinaire Julian Cox. 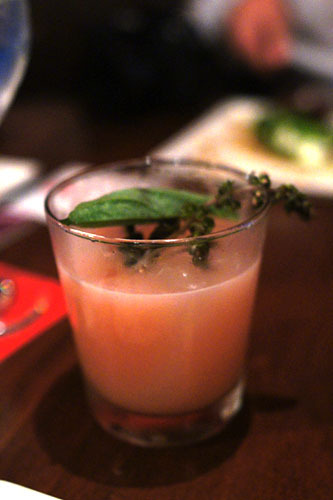 First up was The Deliverance Cocktail (Moonshine / Amontillado Sherry / Orgeat / Concord Grapes / Arugula), which showed off a strong nose of arugula leading to a lovely tangy-herbaceous interplay on the palate, with just a touch of sweetness to counter the weight of the alcohol. 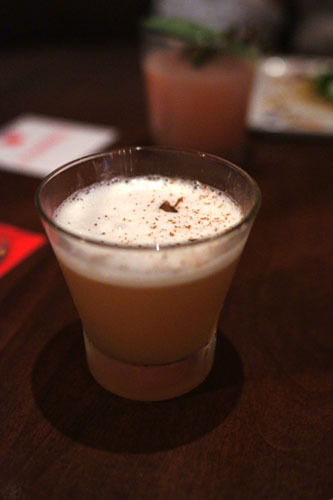 One of my favorites was the Luchador's Lady (Reposado Tequila / Pineapple Gomme / Spiced Hibiscus Tea / Egg White / Cinnamon). I loved its encompassing notes of cinnamon, and how it complemented the tart-woody interaction between the pineapple/hibiscus (which almost had a suan mei-like savor) and tequila. The egg white, meanwhile, served to temper the drink. Finally, we have the most challenging of the troika, the Mayahuel Coctel (Mezcal / Yellow Peach / Don's Mix / Creme de Peche / Meyer Lemon). 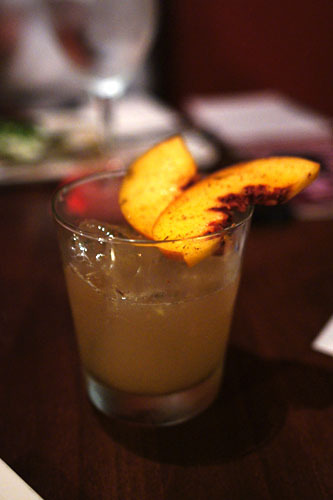 This one did a nice job in highlighting the smoky-savory character of the mezcal, but managed to temper that potency with the overarching sweetness of peach. I was struck by the sheer "redness" of this dish. 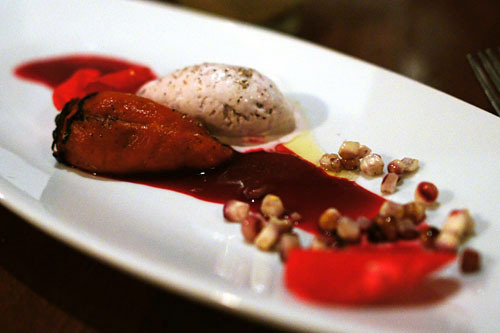 What we have is a lipstick pepper stuffed with crabmeat, paired with a lemon-blueberry-EVOO ice cream, over a sauce of citrus and beet, and then sprinkled with red corn. I started with the pepper, and enjoyed how its light, bright flavors were complemented by the subtle, cool sweetness of the crab. The corn, at the same time, worked wonders in augmenting the crustacean's natural sugariness, while adding a bit of textural play in the process. The ice cream, meanwhile, did a superb job in balancing and integrating the dish. 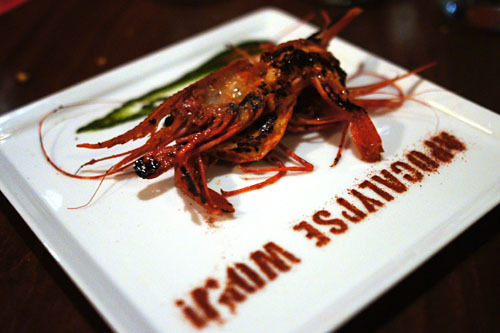 Three intimidating half-slices of achiote-marinated Santa Barbara spot prawn came paired with a yerba santa-licorice sauce, with an additional accoutrement of smoked paprika-Chinese pepper (in the form of Sedlar's stencil "spiceology"). The spot prawns were spot on in terms of flavor, showing off a perfect amalgam of sweet, spicy, and briny flavors, and I also loved the saccharine-hot notes contributed by the accompanying peach-haberno condiment. I only wish that the crustaceans were cooked to a rarer consistency. With our previous cocktails dispensed with, we went on to round two. 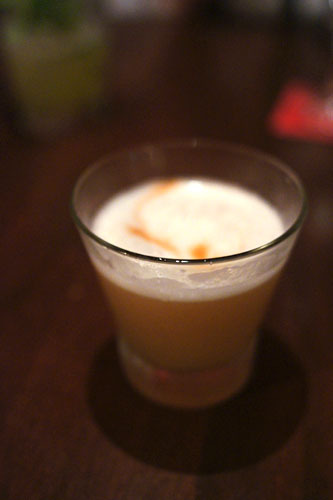 The Autumn Sour (Pear Infused / Apple Jack / Lemon / Grade B Maple) was somewhat similar to the aforementioned Luchador's Lady, with its strong notes of saccharine spice. 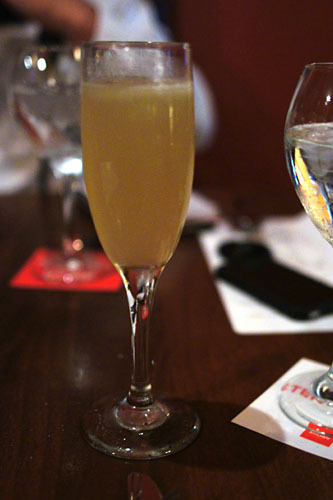 However, it was noticeably tarter, with a fantastic kick from the apple jack. The Pride of Oaxaca (Mezcal Cognac / Lemon / Champagne), meanwhile, was almost perfume-like, demonstrating a tart, nearly medicinal quality that underscored the woodiness of the mezcal. 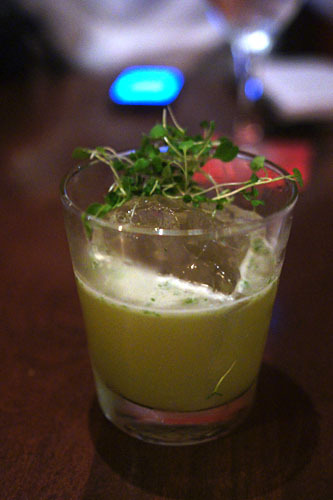 Finally, we requested a "savory" custom cocktail from Cox, and he came back with a bourbon-based libation with microgreens, honey, and lemon. The power of the whiskey was actually very nicely countered by the bitter greens, and I appreciated the engirdling sugariness imparted by the honey--quite nice. Our final savory course of the evening brought us confit pork belly, accompanied by glazed pumpkin, caramelized onion, and a piquant dressing of rocoto pepper, milk, lime, garlic, olive oil, and cotija cheese. The meat, as expected, was unabashedly decadent, with heavy, dark, porcine flavors paired with a lovely bitter bit of char. The pork was deftly moderated by the aforesaid spicy sauce, and also went surprisingly well with the squash (which I thought would be overly saccharine). Great bit of lingering heat on this one, too. Dessert came in the form of fruit--caramelized fig, mango, dragonfruit--escorted by a spicy piloncillo (caramel-like) sauce and a mezcal cream. 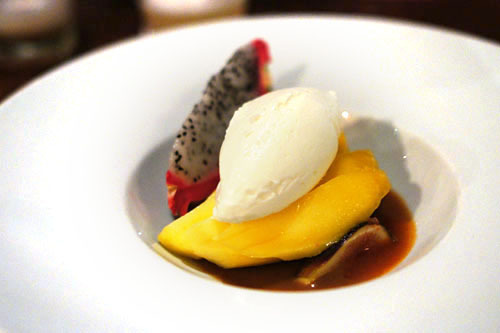 The piloncillo did a superb job in augmenting the natural sweetness of the fruit, while adding just a touch of heat. On the other hand, the mezcal, with its smoky savor, served as a moderating element, linking the various parts of the dish together nicely. A somewhat challenging dessert, but nonetheless enjoyable. All in all, a very good meal. What struck us all, however, was how ambitious the food seemed. Compared to what I've had previously at Rivera, I found the flavors combinations even more adventurous, experimental even. 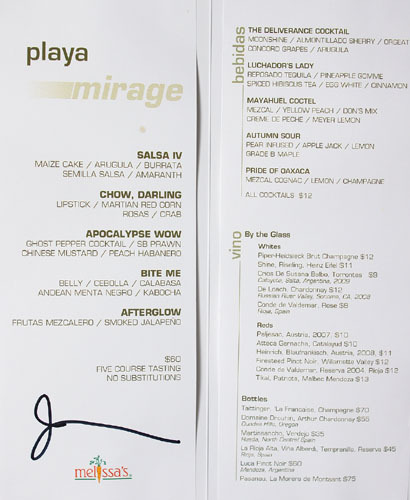 Now, while I appreciate a bit of audacity in my food, I'm not sure if everyone will, especially since Playa is meant to be a lower cost, more casual affair vis-à-vis Rivera. I'll be interested to see how the essence of this meal translates to what's actually presented on the menu at the new restaurant. 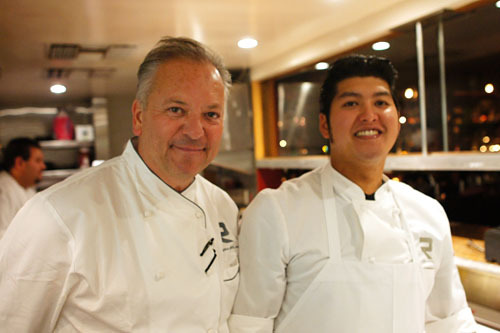 Either way, this dinner's gotten me even more excited about Sedlar's next venture! I'm excited for Playa to open in my neck of the woods since I've yet to get downtown to try Rivera. Especially now... food looks great! Was it family style again or were those individual plates? Charlie: I'm surprised you haven't been! It's easily one of the best places in DTLA, and is a great place for after-work drinks as well. Diana: As with Charlie, I'm shocked that you've yet to get your Rivera cherry popped! As for tonight, it was most definitely individual plates. We are hosting another Sunken City Supper Club dinner in October and our theme is Latin/Spanish, so we took a field trip to Rivera today, and got many great ideas and our server was the best, took time to explain everything, even items we did not order. Sedlar is an inspiration for sure. Love the names of these dishes. Great review as usual. Very cool Lori. Let me know when you have the menu up.